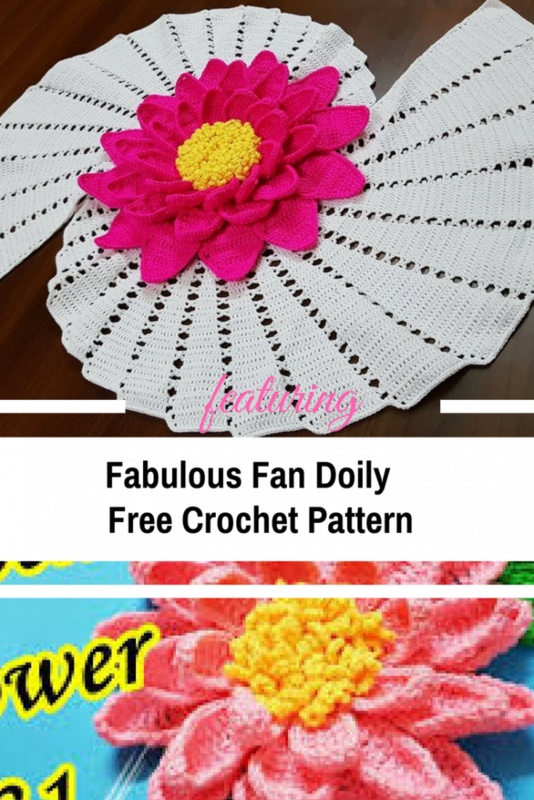 If you like the beautiful flower featured on the crochet fan doily below, you can find the pattern here. Watch the video tutorial below to see how this beautiful centerpiece doily is done. At the end, SlSt in the 1st Dcst not in the Ch. Repeat the same previous steps till we reach the marker and stop. Ok, here we’ve reached the marker. Now turn the work or the piece. Repeat the same previous steps till we reach the block before the last one in this Rw- leave the last block undo. Repeat the same previous steps till we reach the last block in this Rw. Ok. here we’ve reached the 2nd last block and we left the last block undo and we’ve stopped before it. then turn the work or the piece. and this trim will be like this…. and the trim will be only Sc sts. Pattern by Elegant Crochet with Sarah.